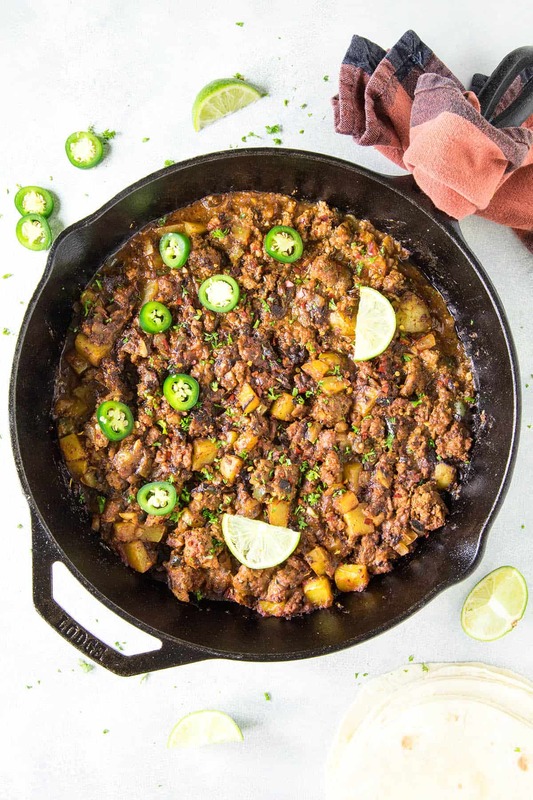 This is my favorite picadillo recipe made Mexican style with toasted ancho peppers, ground beef, potatoes and plenty of Mexican flavors. It’s great over rice or served with tortillas. 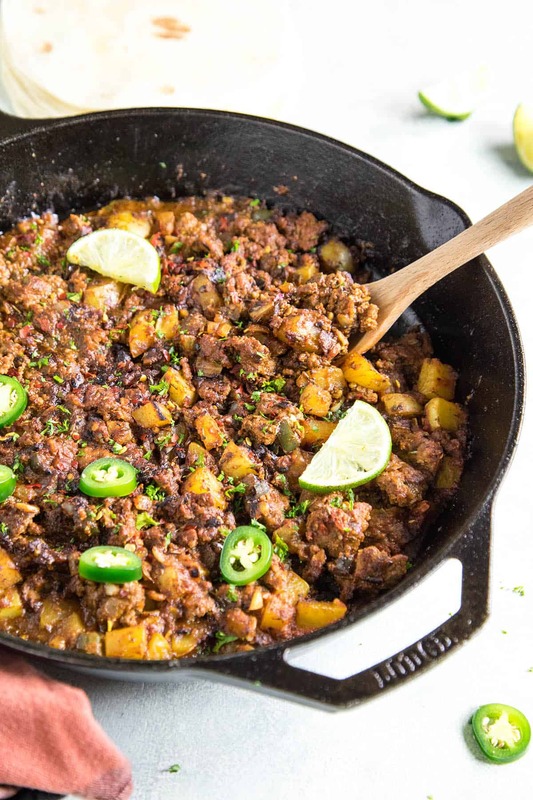 If you’ve never tried picadillo before, this is a recipe you’ll want to add to your recipe collection asap. Immediately. Like, stop reading and write down “Mexican Picadillo” somewhere so you don’t forget to do it later. I am totally hooked on picadillo for a number of reasons. First, it’s incredibly delicious. Second, it is MASSIVE on the spiciness factor, and by spicy, I don’t necessarily mean HOT, but see #1 – FLAVOR. Oh Baby! Third, it’s pretty darned easy to make, and you guys already KNOW I’m a pretty slow cook in the kitchen, so if something is quick and easy for the most part, it’s that much better for me. Don’t get me wrong. I LOVE spending hours and hours in the kitchen, but I just don’t have the time to do so as much as I’d like to. I know, I REALLY need to go full time with this crazy-awesome food blogging life – I will soon, I hope! 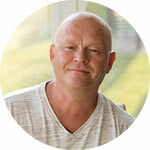 – but as it is with life, other commitments arise, and you just need food on the table quickly. But with flavor! I demand flavor! This dish truly delivers. Comfort food at its finest. 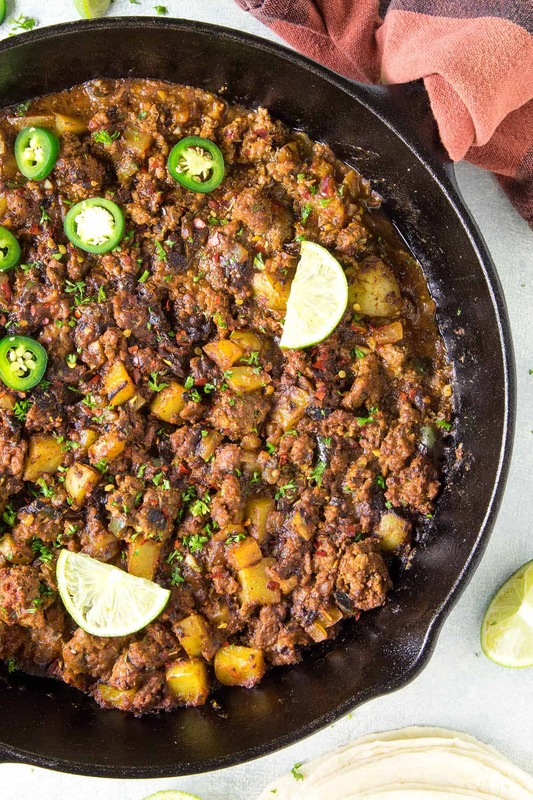 In truth, there are many ways to make a great picadillo, and worry not, my friends! I plan on exploring as many as is humanly possible with you. 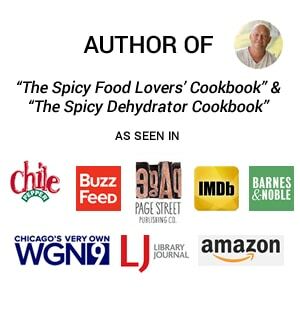 There are versions all over, including Cuban picadillo, Puerto Rican and yes, Mexican, which is the version I’m sharing with you here. I just love Mexican food. How to Make Mexican Picadillo – Let’s Get Cooking! 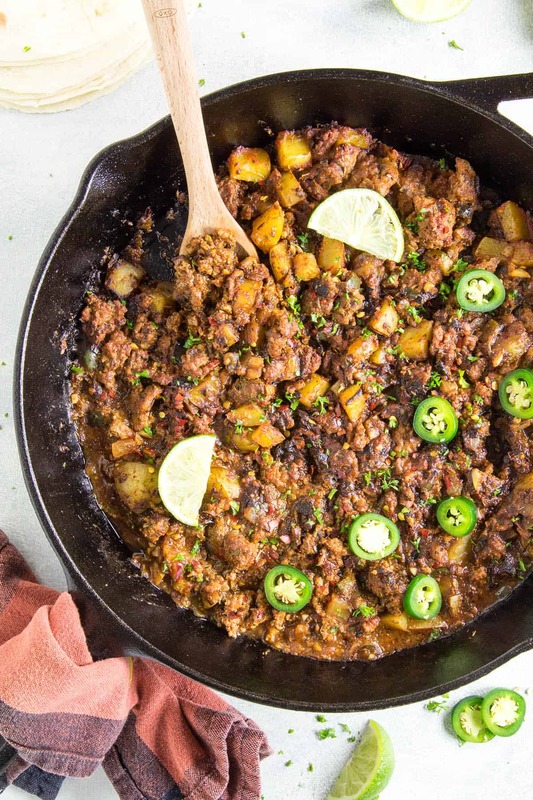 Let’s discuss how we make our Mexican Picadillo, shall we? The first thing we need to do is make some ancho paste. 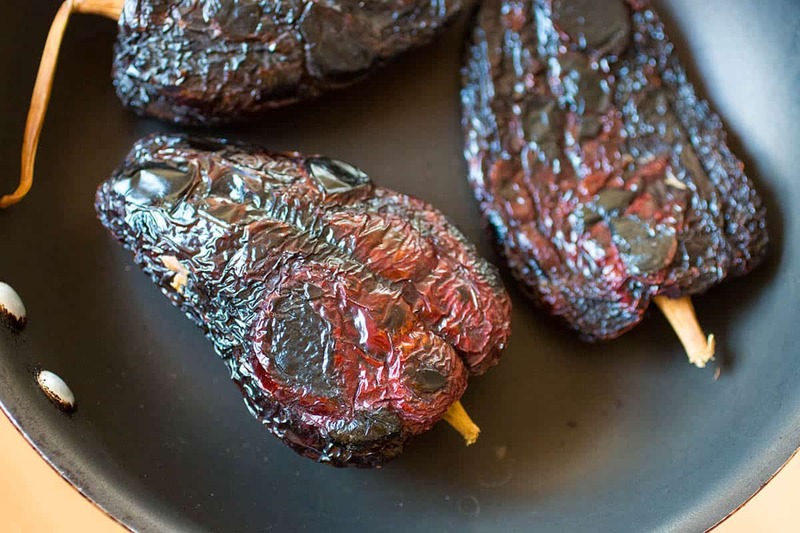 You can check out my Ancho-Guajillo Paste Recipe Here, or just lightly toast a few ancho peppers in a hot, dry pan until the skins become puffy. Make sure they do not burn. This brings out the oils in the peppers. Set them into a bowl and pour boiling water over them. Let them soak for 20 minutes to soften. While the ancho peppers are soaking, cook down the potatoes, onion, peppers and garlic until they are soft in a large skillet. 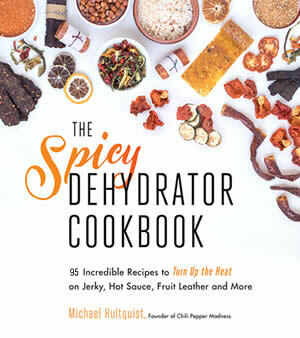 I’ve used jalapeno peppers here, but toss in a serrano pepper for extra heat. Add ground beef and let it brown, then add tomato sauce and your seasonings. Simmer it all together. When the anchos are soft enough, scoop out the seeds and stems and process the skins in a food processor until you get a nice paste, which you’ll swirl into the simmering deliciousness, making it even MORE delicious. Truly! Let the whole thing simmer another 10-20 minutes or longer, until it tastes just right, and serve it up over rice or on tortillas. I can’t decide which way is my favorite! Dang! Stop making me choose, OK?! When it comes to the seasonings, you can use the blend I’ve used below, or just use your favorite taco seasonings as a time saver. Try this Homemade Taco Seasoning Blend Recipe that I love. As mentioned, you can easily serve this up in bowls or on a plate with white rice or with tortillas as your main dish. Add on a few toppings, like fresh chopped onion, cilantro, sliced fresh or roasted peppers. Consider it as a side dish as well, so serve along a nice roasted pork or lamb dish. I think it would go great with those. Or, try my picadillo stuffed poblano peppers recipe. Turned out GREAT! This meal is freezer friendly. If you have leftovers, store them in an airtight container and freeze it for up to 3 months. I often make a larger batch of picadillo just so I can freeze it. It thaws easily and makes for a quick and easy lunch or dinner. That’s it! I hope you LOVE this as much as I do! SO. GOOD! Let me know if you make it. Send pics! I want to hear!! 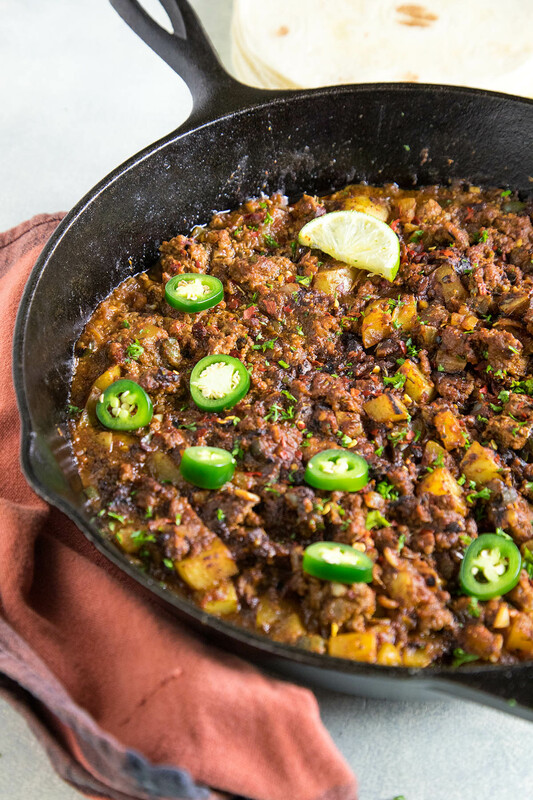 — Mike H.
This is my favorite picadillo recipe made Mexican style with toasted ancho peppers, ground beef, potatoes and plenty of Mexican flavors. It's great over rice or served with tortillas. Heat a pan to medium-high heat and dry toast the ancho peppers on each side until the skins become puffy. Make sure they do not burn. This brings out the oils in the peppers. Set them into a bowl and pour boiling water over them. Let them soak for 20 minutes to soften. While the ancho peppers are soaking, heat a large pan to medium heat and add the olive oil. Add the potatoes, onion and peppers and cook them down about 5 minutes to soften. Stir in the garlic and ground beef. Break up the ground beef with a wooden spoon and brown it up about 5 minutes or so. Stir in the tomato sauce and seasonings and reduce the heat to simmer. 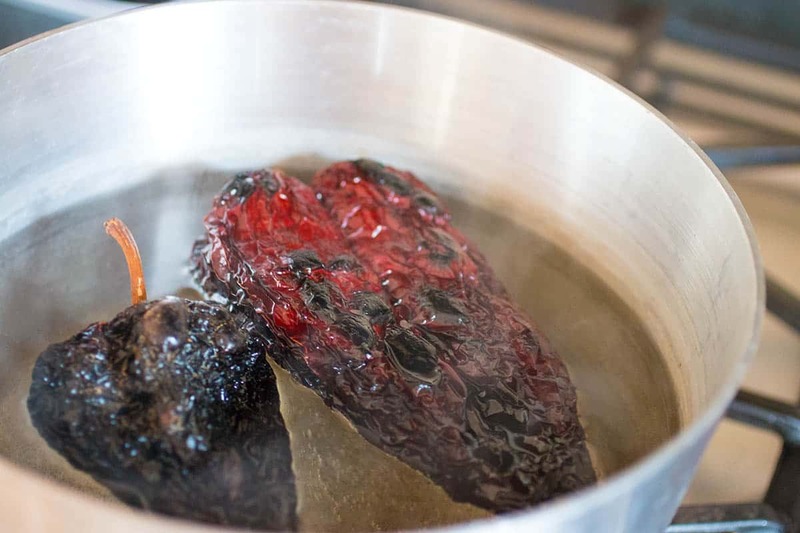 Remove the stem and seeds from the rehydrated ancho peppers. Add the pepper skins to a food processor along with a bit of the darkened ancho water, about a tablespoon or so. Process until it is very smooth. Swirl the ancho paste into the meat mixture and allow it to simmer at least 10 minutes. 20 minutes or longer is better. If you need more moisture, add in a few tablespoons of water or extra tomato sauce. Serve over cooked rice or tortillas with extra peppers, spicy chili flakes and lime juice! Don’t forget your favorite hot sauce. Heat Factor: Medium, though it is PACKED with flavor. 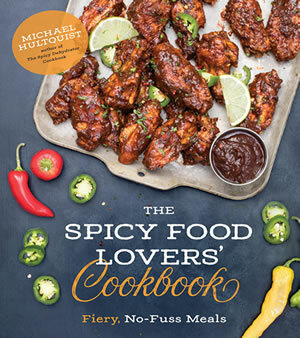 You can easily add more heat with hotter peppers or chili flakes, or by adding your favorite hot sauce. What timing! I have everything already and was wondering what to make with the hamburger. I will add a little heat and some chopped mushrooms, and make burritos out of it. Excellent idea! This would make GREAT burritos.